The Royal Lodge01600 890238work Guest AccommodationThe Royal Lodge, located in Symonds Yat East, Herefordshire was originally built in 1876 as a former hunting lodge. 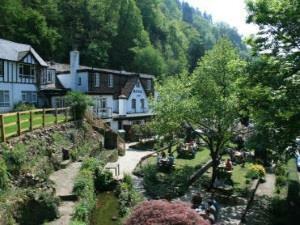 With our idyllic setting in the heart of the Wye Valley, on the edge of the spectacular Forest of Dean, we are nestled just below Symonds Yat Rock overlooking the River Wye. With 25 en-suite bedrooms, 21 are arranged to take advantage of the views of the tranquil river and mature gardens. We have a selection of Superior, Classic, Standard, Twin, Family and Single Rooms as well as our 4 Poster Room which allows us to offer unrivalled flexibility. We also added our latest guest room in 2016, The Oak Suite, which is a beautifully decorated luxury room, offering exceptional views of the river from the Juliet balcony. All the rooms are comfortably furnished in-keeping with the buildings character. We also have a selection of pet friendly rooms which are available to book directly. Our newly added Kingfisher Suite is a spacious room with picturesque river views seating up to 120 people. It has proven popular for private use such as weddings, special occasions and corporate events. Use the Royal Lodge as a base to explore the Wye Valley, Forest of Dean and participate in a variety of outdoor activities. Canoeing & kayaking is right on our doorstep, with pottery and clay pigeon shooting also available nearby. We are also a great location for walking routes, with a choice of 4 from our doorstep varying in distance, but with a lot to see on route including The Biblins Bridge, Symonds Yat Rock and King Arthur’s Cave. Our onsite restaurant offers exciting and innovative cuisine throughout the day, starting with a hearty freshly cooked breakfast, through to sandwiches and light bites over lunchtime and then a bar and grand prix menu in the evening. Our popular afternoon tea menu is also available daily with a wide choice of mouth watering options on offer. Available for guests as well as public alike, we are a pet friendly venue allowing you to bring the whole family to us for a relaxing and rejuvenating time. The Royal Lodge, located in Symonds Yat East, Herefordshire was originally built in 1876 as a former hunting lodge. With our idyllic setting in the heart of the Wye Valley, on the edge of the spectacular Forest of Dean, we are nestled just below Symonds Yat Rock overlooking the River Wye. Suitable all year round, you can view the spectacular colour change of the trees during the autumn and winter months, whilst warming up alongside our roaring log fires. Then in spring and summer, we become a hive of activity with the sun illuminating the stunning scenery.